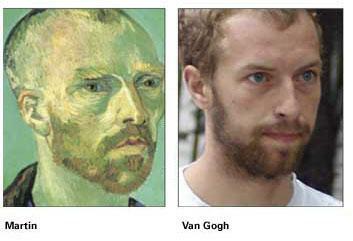 One's a depressing artist, the other one of the most famous painters to have graced canvas. Another corking Private Eye lookalike. Maybe Chris Martin should cut off both his ears to save himself the trouble of having to hear his own songs; who knows maybe he'd make better music - Beethoven was supposedly deaf and check his prolific classical output. As for those ('scuse the pun! ), 'limp-wristed' biro-slogans, they, um, wash off, so who knows if Chris really means it or not, he could be faking it. Be a man & do it Henry Rollins style -get some tats or get those messages cattle-branded.